Always Think Bigger: Daddy dressed Me! One of the greatest highlights of my day, is getting pictures from my husband of our kiddos! Since he has the babies all day long, by himself, I don't always get to join in the fun of picking out cute clothes for our little babies! 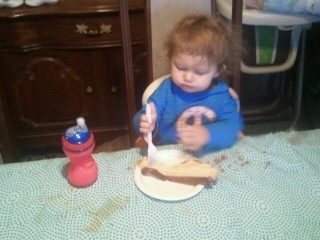 Here are a few of the sweet pictures he has sent me over the past few weeks. 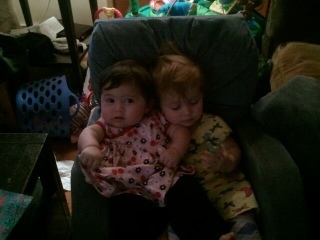 I really like this one of the babies sitting in the toddler chair together! 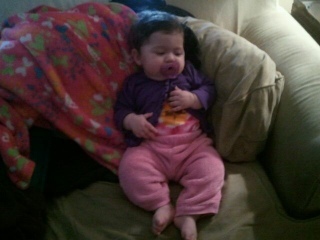 It's a chair full of baby!!! Geoff was really proud of this outfit, tie-dyed onsie, purple jacket and pink snuggly sweatpants...seriously, do these children get any cuter!?!?!?!? Lissy is quite proud of her climbing abilities. 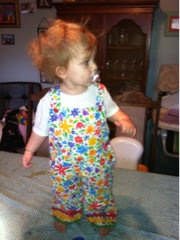 I however, am loving these overalls! So far, she and Annie have each worn them and every time it is so cute!!! I still love how cute she is in the peace sign tshirt and she (and the big kids) really enjoyed the challah Geoff made. It had a cream cheese filling rolled into it before the whole thing was braided into a round challah. Seriously, it was amazing. And of course, who wouldn't love a child wearing a fabric headband. 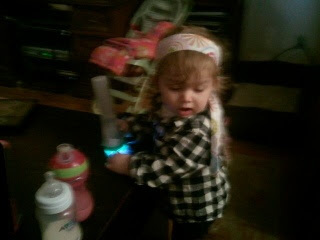 She looks like a hippie baby and it so cute! I feel like I should be asking her when she's going to clean the toys up!